Our artists, painters and sculptors have put their talents at your disposal. They work for your pleasure. That is our philosophy: "ART for PLEASURE!" It is our responsibility to be attentive to established artists as well as emerging ones. 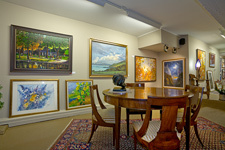 You will therefore find that our gallery is well balanced with many different styles offered. We are well aware that the artwork that you purchase which will adorn the place where you live or work should conform perfectly to your needs and decorative environment. For example, we collaborate with each of our clients when choosing the proper frame. We contract with ENCADREMENT DU CAP in Baie-Saint-Paul. This assures that you will have the frame of your choice at "gallery" prices". In most cases, if you want to change the frame of your painting, since the cost of the frame is already included, there won't be any extra expense. We are sensible to the needs of our clients. In fact, this is our primary concern. We must also be sensitive to the financial objectives of our artists. 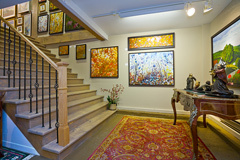 This is why the artists whom we represent have, in common, enjoy a sound, long-lasting and profitable association with our gallery. Today, there is an abundance of diversified talent. When selling a quality piece of art, assuring an affordable price is one of the most important determining factors. We are firmly committed to pricing our art competitively and fairly.